ASHLAND UNITED METHODIST CHURCH was formed in 1953 by the merger of Hundley Methodist and Trinity (German) Methodist churches. The present building at Ashland and Gene Field Road was built in 1954, and houses an 1895 Hinners & Albertsen tracker pipe organ which was originally acquired by the German Methodist Episcopal (Trinity) Church of St. Joseph at 3rd & Robidoux Streets, under the leadership of Professor Philip Wesley Kost. Professor Kost served as the church’s organist and choirmaster for 60 years until his death in 1927. He was succeeded by Edna Michel who and served as organist until her death in 1971. One of her young students was Orpha Ochse, who became a nationally recognized author, lecturer, composer and recitalist. Upon her death, Mrs. Michel was succeeded by co-organists, Sara Mahaffy and Carol Jean Laurent, a great niece of Prof. Kost. Mrs. Laurent retired in 1999. Thus, only four organists have served this church and its predecessor over a 140 year span. Both congregations left behind old tracker organs, which were considered antiquated. The 1873 E. & G.G.Hook organ in the Hundley Church, which was probably the oldest organ in the city and the only article to survive a fire in its first home, Christ Episcopal Church, on Christmas Eve 1876, was apparently discarded several years later. 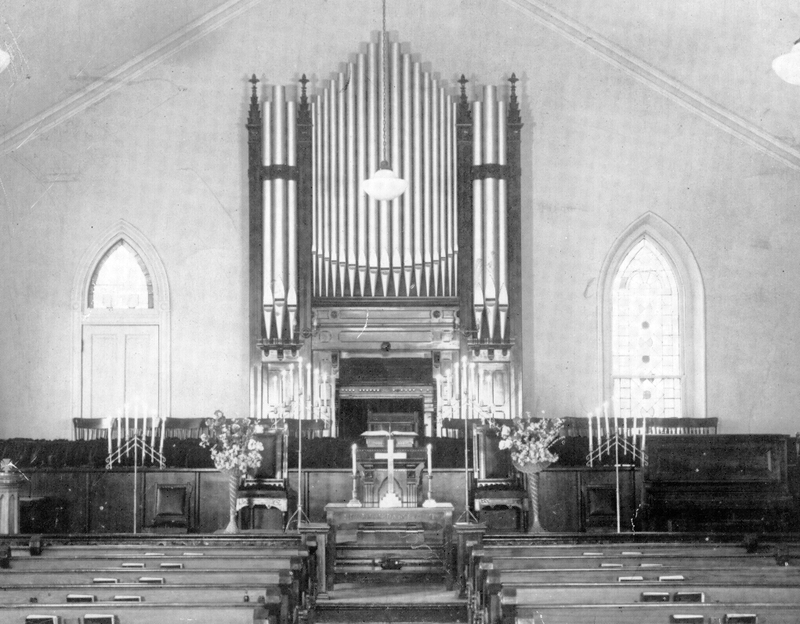 The new church was equipped with a “modern” electronic organ, however, Edna Michel always secretly wished the Hinners organ could some day be relocated to the new church. The Hinners & Albertsen organ sat silent for 20 years in the old Trinity Church, which had been purchased by Holsey Chapel. When the building was scheduled to be razed in 1973 as part of the Urban Renewal Program, the organ was offered to Ashland Church. This coincided with renewed interest in tracker action organs. Dr. Ochse recommended that the church purchase and restore the organ. When the chancel was measured for the organ, it was discovered that the allocated space was within an inch of being exactly the right size. Charles McManis of Kansas City, Kansas was hired to move and repair the organ. He replaced the original hand-pumped “feeder bellows” with an electric blower and added a reed (Oboe) stop to the Swell division. Church members, under the direction of Louis Hees stripped and refinished the elaborate poplar case. Artist Janice O’Quinn, wife of Pastor Bill O’Quinn, restored the original stenciling on the case pipes. The relocation and restoration of the organ was underwritten by the widow of one of Prof. Kost’s nephews, Tena Kost, who was also one of his piano students. Dr. Ochse played the dedicatory recital on February 17, 1974. In 1987, Dr. Ochse retired as Professor of Music at Whittier (CA) College. In addition to serving as a teacher and lecturer, Dr. Ochse’s distinguished activities in the organ profession have included European recital tours, published compositions for organ, and research studies in various aspects of organ playing and organ history. Her first book, “The History of Organ in the United States” (Indiana Press, 1975) has become a standard reference. A second book, “Organists and Organ-playing in 19th Century France and Belgium” was published in 1994, and a third covering the history of the highly innovative Austin Organ Company, “Austin Organs”, in 2001. She has served on the National Council of the American Guild of Organists and as Dean of the Central Arizona and Pasadena Chapters. In 1991, the she was elected a lifetime honorary member of the OHS. In her book, “The History of the Organ in the United States”, Dr. Ochse notes that Hinners & Albertsen catered to small churches throughout the Midwest by offering sturdy, but inexpensive pipe organs, built along standardized models. These organs were promoted by a catalogue written in both German and English, and sold on a direct-mail order system, employing no salesmen in order to reduce cost, and thus, the price. “The company’s location in central Illinoois ws advantageous for reaching numerous German communities that developed in the Midwest during the late nineteenth century. Many of these communities maintained German schools and continued to hold church services in German until World War I. One such church was the German Methodist Church (later Trinity Methodist) in St. Joseph, Missouri.” P. 300. In the 1890’s, the average cost of a one manual Hinners & Albertsen organ was slightly over $100 per rank, including installation. If churches close to the factory wished to reduce the cost, they could send members to the factory with their own wagons, thus saving some shipping and set-up costs, reducing the final price to $75/rank. According to church history, Trinity’s 13 rank organ, which was large by Hinners’ standards, cost $1,500, or approximately $155 per rank. Both John L. Hinners and Kost were of direct German descent and the sons of German Methodist missionaries. Kost’s father, Rev. J.G. Kost, was a circuit rider prior to serving as pastor of the St. Joseph church from 1866-70. Hinners was a carpenter by trade before entering the organ business, which is reflected in the high quality of both his reed and pipe organ cases. There was a variety in Hinners’ organ case design. some of which were quite elaborate. This was an important feature for smaller congregations like Trinity, in whose chaste worship space, the organ was the most prominent architectural statement, just like the reed organ, with its ornamental canopy, was often the central piece of furniture in a rural parlor. Executed in poplar, this is one of the more elaborate designs, reflecting the emerging Modern aesthetic, in which heavy pediments, elaborate arches and other supporting architectural elements around the pipe flats that typified Gothic cases like Christ Church’s organ, disappeared, leaving only minimal “bedposts” and an occasional simple cross support band, like those on the side prows. These, too, would disappear by the time the Trinity United Brethren and First Baptist organs were built in which the case pipes appear totally unsupported. The Hinners company built more than 3,000 pipe organs over a 46 year span. All but 500 built after 1916 were tracker action. While other builders offered larger, more versatile instruments demanded by larger churches, Hinners continued to concentrate on smaller, relatively inexpensive organs for small churches. During the Great Depression, sales plummeted 90%, and by 1936, the company was kaput. On April 15, 2007, with Dr. Ochse present, the Organ Historical Society conferred its 350th Historic Organ Citation on this instrument. Headquartered in Richmond, Virginia, the OHS seeks to recognize pipe organs of historic merit, which are worthy of preservation due to rarity or as an unaltered example of a particular style or builder’s work. The society began issuing citations in 1975. 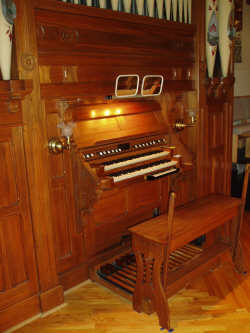 By coincidence, “350” was assigned by Hinners & Albertsen as the original contract or “Opus” number for this pipe organ. 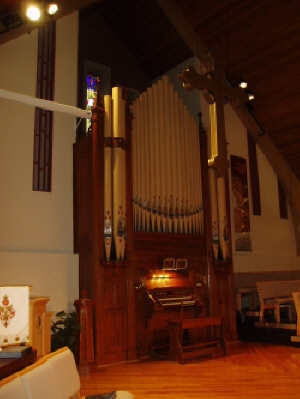 Only nine other pipe organs in the Missouri have received this distinction, including two other St. Joseph organs, the monumental 1907 Hook & Hastings pipe organ in the First Church of Christ, Scientist, and the 1911 Gustav Treu organ in Trinity United Brethren Church. To date, only two other Hinners’ organs have received a citation. 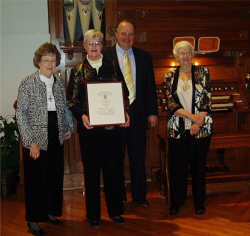 Carol Jean Laurent, Organist Emeritus and great niece of Prof. Philip Wesley Kost, who procured the organ for the German Methodist Church in 1895, Sara Mahaffy, Church Organist, David Lewis, OHS representative and Dr. Orpha Ochse display Historic Organ Citation #350, which was presented on April 15, 2007. Kost, Laurent, Mahaffy and the late Edna Michel are the only four organists to serve this congregation over a 140 year span. Above: “TRACKER ACTION” in Ashland United Methodist Church’s mechanical action pipe organ. Before the application of electricity to the pipe organ’s “action”, the keys were connected to the chest valves under the pipes via a mechanical linkage, which comprised a series of thin wood strips, called “trackers”. They begin vertically behind the keyboards and pass horizontally overhead, along the bottom of the windchests to the chest valves at the back of the organ. Below are the metal rods and wooden “rollers” connecting the “drawknobs”, controlling individual stops, to the chests action. Below the stop action is the regulator (not visible), which looks like a bellow, but does not pump, acting as a reservoir for steady wind supply to the chests. A square wood trunk in the right rear corner connects it to the windchest above. Left: CASE PIPES, Ashland United Methodist Church. The length of the pipe determines the pitch, however, for artistic reasons, the “speaking pipes” in the case of this organ needed to be longer, so the builder added the baffled sections to the top of these pipes to maintain the symmetry of the case pipe layout. 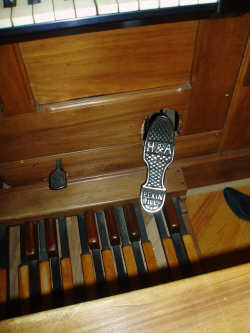 In the foreground is a “walkboard”, on which the organ tuner must stand in order for reach certain pipes and access the “Swell Box”, which holds the pipes for the “Swell” division’s stops. The organbuilder has stenciled the company’s name on the access panel. 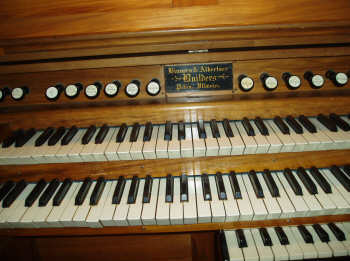 The mechanical linkage between the drawknobs and the slider boards controlling individual stops, as well as the keys and the chest valves controlling individual notes, dictates short runs between the connecting points. Otherwise, without mechanical assistance, the key action can become very stiff. Therefore, self-contained pipe organs were typical until the late nineteenth century, as the keydesks were built directly into the case. While, some tracker organs feature detached consoles, they are typically very close to the organ case, such as the new tracker organ at Conception Abbey. Hinners organ presently in Ashland Church, in its first home at Trinity German Methodist Church.